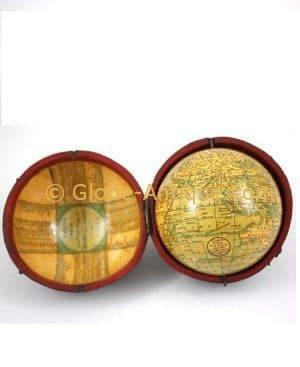 The Terrestial Pocket Globe is a 3-Inch diameter made up of twelve hand coloured engraved paper gores. In the ocean representation it features the tracks of the voyage of discovery of Capitan Cook and other circumnavigators contained in a fishskin-covered case. The interior features a printed world map with the inscription “The world as known Cesar’s time agreeable to Danville” and “a table of latitudes and longitudes of places not given on this globe”. Co-ordinates: meridians every 15 degrees , parallels every 10·.The prime meridian is labelled : Meridian of Greenwich. The equator is graduated (E and W 0·-180·) numbered every 10·, division 5· and it is labelled Equator or Equinoxial Line. 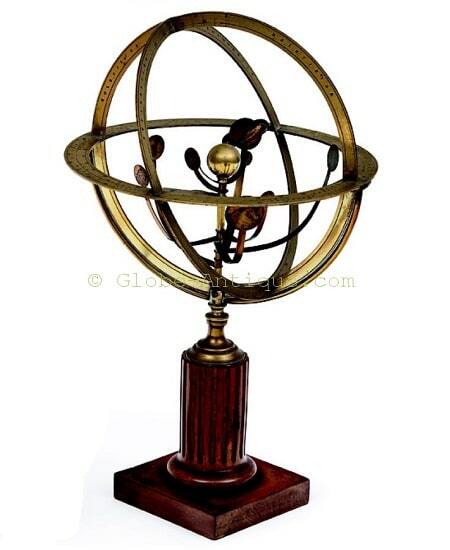 The Ecliptic is graduated 12 times 0·-30· and is provided with the symbols of signs of zodiac.